Erskine had long sought the opportunity to conduct a battalion-sized night operation. It rankled him that throughout the war the Americans seemed to have conceded the night to the Japanese. When Hill 362-C continued to thwart his advance, Erskine directed a pre-dawn advance devoid of the trappings of prep fires which always seemed to identify the time and place of attack. The distinction of making this unusual assault went to Lieutenant Colonel Harold C. "Bing" Boehm, commanding the 3d Battalion, 9th Marines. Unfortunately this battalion was new to this particular sector and received the attack order too late the previous day to reconnoiter effectively. The absence of advance orientation notwithstanding, the battalion crossed the line of departure promptly and silently at 0500 and headed for Hill 362-C. The unit attained total surprise along its axis of advance. Before the sleepy Japanese knew it, the battalion had hurried across 500 yards of broken ground, sweeping by the outposts and roasting the occasional strongpoint with flamethrowers. Then it was Boehm's turn to be surprised. Daylight revealed his battalion had captured the wrong hill, an intermediate objective. Hill 362-C still lay 250 yards distant; now he was surrounded by a sea of wide-awake and furiously counterattacking Japanese infantry. Boehm did what seemed natural: he redeployed his battalion and attacked towards the original objective. This proved very rough going and took much of the day, but before dark the 3d Battalion, 9th Marines stood in sole possession of Hill 362-C, one of Kuribayashi's main defensive anchors. Attached to the assault divisions of the landing force at Iwo Jima were provisional rocket detachments. The infantry had a love-hate relationship with the forward-deploying little rocket trucks and their plucky crews. The "system" was an International one-ton 4x4 truck modified to carry three box-shaped launchers, each containing a dozen 4.5-inch rockets. A good crew could launch a "ripple" of 36 rockets within a matter of seconds, providing a blanket of high explosives on the target. This the infantry lovedbut each launching always drew heavy return fire from the Japanese who feared the "automatic artillery." 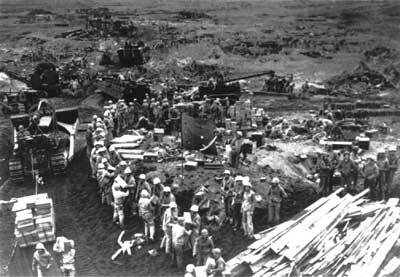 Treeless, hilly Iwo Jima proved an ideal battleground for these so-called "Buck Rogers Men." At Iwo, the 1st Provisional Rocket Detachment supported the 4th Marine Division and the 3d Detachment supported the 5th Division throughout the operation (the 3d Division did not have such a unit in this battle). Between them, the two detachments fired more than 30,000 rockets in support of the landing force. The 3d Detachment landed over Red Beach on D-day, losing one vehicle to the surf, others to the loose sand or heavy enemy fire. One vehicle reached its firing position intact and launched a salvo of rockets against Japanese fortifications along the slopes of Suribachi, detonating an enemy ammunition dump. The detachment subsequently supported the 1st Battalion, 28th Marines' advance to the summit, often launching single rockets to clear suspected enemy positions along the route. As the fighting moved north, the short range, steep angle of fire, and saturation effect of the rocket launchers kept them in high demand. They were particularly valuable in defilade-to-defilade bombardments marking the final punctuation of pre-assault prep fires. But their distinctive flash and telltale blast also caught the attention of Japanese artillery spotters. The rocket trucks rarely remained in one place long enough to fire more than two salvos. "Speedy displacement" was the key to their survival. The nearby infantry knew better than to stand around and wave goodbye; this was the time to seek deep shelter from the counterbattery fire sure to follow. Boehm's success, followed shortly by General Senda's costly counterattack against the 4th Marine Division, seemed to represent another turning point of the battle. On D+18 a patrol from the 3d Marine Division reached the northeast coast. The squad leader filled a canteen with salt water and sent it back to General Schmidt marked "For inspectionnot consumption." Schmidt welcomed the symbolism. The next day the 4th Marine Division finally pinched out Turkey Knob, moving out of The Amphitheater towards the east coast. The end seemed tantalizingly close, but the intensity of Japanese resistance hardly waned. Within the 5th Marine Division's zone in the west, the 2d Battalion, 26th Marines, was reporting an aggregate casualty rate approaching 70 percent. General Rockey warned of a state of "extreme exhaustion and fatigue." The division commanders began to look elsewhere for relief of their shot-up battalions. In the 4th Marine Division, General Cates formed a provisional battalion under Lieutenant Colonel Melvin L. Krulewitch which conducted a series of attacks against the many bypassed enemy positions. The term "mopping up" as applied to Iwo Jima, whether by service troops or subsequent Army garrison units, should be considered relative. Many pockets of Japanese held out indefinitely, well-armed and defiant to the end. Rooting them out was never easy. Other divisions used cannoneers, pioneers, motor transport units, and amtrackers as light infantry units, either to augment front-line battalions or conduct combat patrols throughout rear areas. By this time, however, the extreme rear area at Iwo had become overconfident. Movies were being shown every night. Ice cream could be found on the beach. Men swam in the surf and slept in tents. This all provided a false and deadly sense of security. The V Amphibious Corps at Iwo Jima used every conceivable means of delivering combat cargo ashore when and where needed by the landing force. These means sequentially involved the prescribed loads and units of fire carried by the assault waves; "hot cargo" preloaded in on-call waves or floating dumps; experimental use of "one-shot" preloaded amphibious trailers and Wilson drums; general unloading; administrative unloading of what later generations of amphibians would call an "assault follow-on echelon"; and aerial delivery of critically short items, first by parachute, then by transports landing on the captured runways. In the process, the Navy-Marine Corps team successfully experimented with the use of armored bulldozers and sleds loaded with hinged Marston matting delivered in the assault waves to help clear wheeled vehicles stuck in the soft volcanic sand. In spite of formidable early obstaclesfoul weather, heavy surf, dangerous undertows, and fearsome enemy firethe system worked. Combat cargo flowed in; casualties and salvaged equipment flowed out. The Marines fired an unprecedented half million artillery rounds in direct and general support of the assault units. More rounds were lost when the 5th Marine Division dump blew up. The flow never stopped. The Shore Party used DUKWs, LVTs, and larger craft for rapid offloading of ammunition ships dangerously exposed to Iwo Jima's enemy gunners. Marine Corps ammunition and depot companies hustled the fresh munitions ashore and into the neediest hands. Lieutenant Colonel James D. Hittle, USMC, served as D-4 of the 3d Marine Division throughout the battle of Iwo Jima. While shaking his head at the "crazy-quilt" logistic adaptations dictated by Iwo's geography, Hittle saw creative staff management at all levels. The 3d Division, earmarked as the reserve for the landing, found it difficult to undertake combat loading of their ships in the absence of a scheme of maneuver on shore, but the staff made valid assumptions based on their earlier experiences. This paid huge dividends when the corps commander had to commit the 21st Marines as a separate tactical unit well in advance of the division. Thanks to foresightful combat loading, the regiment landed fully equipped and supported, ready for immediate deployment in the fighting. To augment the supplies coming across the beach, the 3d Division staff air officer "appropriated" a transport plane and made regular runs to the division's base in Guam, bringing back fresh beef, mail, and cases of beer. The 3d Division G-4 also sent his transport quartermaster (today's embarkation officer) out to sea with an LVT-full of war souvenirs; these were bartered with ship's crews for donations of fresh fruit, eggs, bread"we'd take anything." General Erskine distributed these treats personally to the men in the lines. Retired Brigadier General Hittle marveled at the density of troops funnelled into the small island. "At one point we had 60,000 men occupying less than three-and-a-half square miles of broken terrain." These produced startling neighbors: a 105mm battery firing from the middle of the shore party cantonment; the division command post sited 1,000 yards from Japanese lines; "giant B-29s taking off and landing forward of the CP of an assault regiment." In the effort to establish a fresh-water distilling plant, Marine engineers dug a "well" near the beach. Instead of a source of salt water the crew discovered steaming mineral water, heated by Suribachi's supposedly dormant volcano. Hittle moved the 3d Division distilling site elsewhere; this spot became a hot shower facility, soon one of the most popular places on the island. The enemy position was a maze of caves, pillboxes, emplaced tanks, stone walls and trenches . . . . We beat against this position for eight continuous days, using every supporting weapon. The coremain objective of the sectorstill remained. The battalion was exhausted. Almost all leaders were gone and the battalion numbered about 400, including 350 replacements. 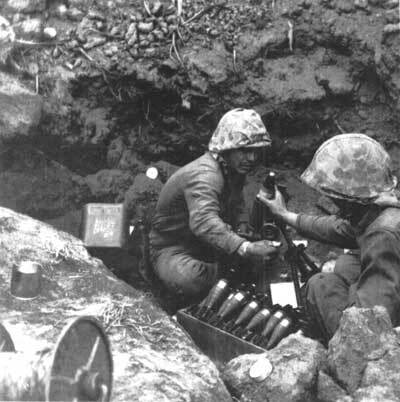 Cushman's 2d Battalion, 9th Marines, was relieved, but other elements of the 9th and 21st Marines, equally exhausted, had just as difficult a time. Erskine truly had no reserves. He called Cushman back into the pocket. By 16 March (D+25), Japanese resistance in this thicket of jumbled rocks ended. The 4th Marine Division, meanwhile, poured over the hills along the east, seizing the coast road and blasting the last Japanese strongpoints from the rear. Ninety percent of Iwo Jima now lay in American hands. 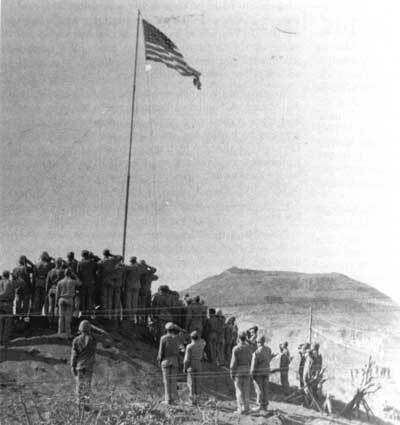 Radio Tokyo carried the mournful remarks of Prime Minister Kuniaki Koiso, who announced the fall of Iwo Jima as "the most unfortunate thing in the whole war situation." The killing continued in the north. The 5th Marine Division entered The Gorge, an 800-yard pocket of incredibly broken country which the troops would soon call "Death Valley." Here General Kuribayashi maintained his final command center in a deep cave. Fighting in this ungodly landscape provided a fitting end to the battlenine endless days of cave-by-cave assaults with flamethrowers and demolitions. Combat engineers used 8,500 tons of explosives to detonate one huge fortification. Progress was slow and costlier than ever. General Rockey's drained and depleted regiments lost one more man with every two yards gained. To ease the pressure, General Schmidt deployed the 3d Marine Division against Kitano Point in the 5th Division zone. Colonel Hartnoll J. Withers directed the final assault of his 21st Marines against the extreme northern tip of the island. General Erskine, pneumonia be damned, came forward to look over his shoulder. The 21st Marines could see the end, and their momentum proved irresistible. In half a day of sharp fighting they cleared the point of the last defenders. Erskine signalled Schmidt: "Kitano Point is taken." Both divisions made serious efforts to persuade Kuribayashi to surrender during these final days, broadcasting appeals in Japanese, sending personal messages praising his valor and urging his cooperation. Kuribayashi remained a samurai to the end. He transmitted one final message to Tokyo, saying "we have not eaten or drunk for five days, but our fighting spirit is still running high. We are going to fight bravely to the last." Imperial Headquarters tried to convey the good news to him that the Emperor had approved his promotion to full general. There was no response from Iwo Jima. Kuribayashi's promotion would be posthumous. Fragmentary Japanese accounts indicate he took his own life during the night of 25-26 March. General Schmidt received the good news that the 5th Marine Division had snuffed out the final enemy cave in The Gorge on the evening of D+34. But even as the corps commander prepared his announcement declaring the end of organized resistance on Iwo Jima, a very well-organized enemy force emerged from northern caves and infiltrated down the length of the island. This final spasm of Japanese opposition still reflected the influence of Kuribayashi's tactical discipline. The 300-man force took all night to move into position around the island's now vulnerable rear base area, the tents occupied by freshly arrived Army pilots of VII Fighter Command, adjacent to Airfield No. 1. The counterattacking force achieved total surprise, falling on the sleeping pilots out of the darkness with swords, grenades, and automatic weapons. The fighting was as vicious and bloody as any that occurred in Iwo Jima's many arenas.